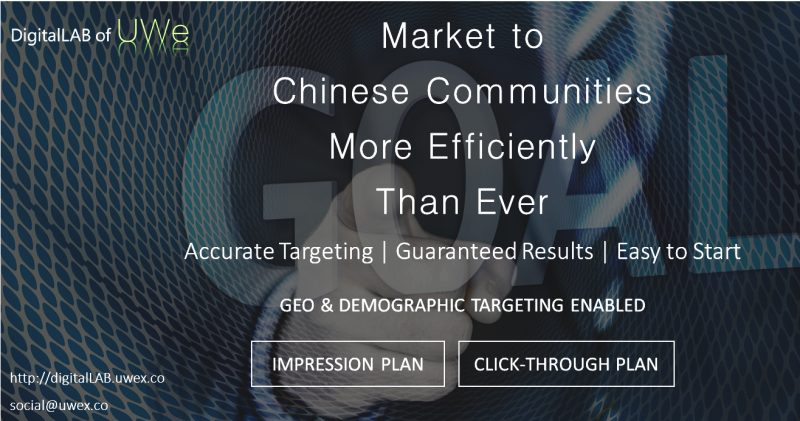 If you have ever seriously considered bringing more Chinese customers, especially those out of the reach of Facebook, into your business, please take some time to learn our services enabled by UWe TARGET, which can help you find target customers by geo-location and demographics. In a recent case, we successfully reached 95,831 Chinese customers living in Ontario and B.C, …. The accurate target plus the creative feed on Weibo won a 47% CTR. UWe TARGET is a unique algorithm to accurately locate the target customers with login IP address, demographics, and their social media footprints. We now can target these Chinese customers by Country in Canada, U.S, U.K., Japan, Australia, and China. In Canada, we can go further by major metropolitan areas, like Toronto, Vancouver, Montreal, Calgary and Edmonton. They could be found by age as well. In a recent case, we successfully reached 95,831 Chinese customers living in Ontario and B.C, age above 16, for a one week PR campaign for a national telecommunication company. The accurate target plus the creative feed on Weibo won a 47% CTR. In another case, we helped a day camp organizer launched a contest in the GTA targeting on Chinese parents of kids age 6-12. It had more than 7,000 interactions under a very small budget. The client asked us to do it again for them soon. You can find more but not all successful cases on our website https://digitallab.uwex.co/ . Chinese are less likely to use Facebook, Twitter, or Google. But they are very active on Chinese social media and Chinese search engine. Geo-targeting and demographic targeting is not strange to advertisers on Facebook or Google. They have been greatly improving the cost efficiency of advertising. However, you may find it not so efficient to reach out to Chinese customers with these social media or search engines, even though your contents are in Chinese. Why? Because there are very limited active Chinese users you can reach with them. For certain well known reasons, Chinese are less likely to use Facebook, Twitter, or Google. But they are very active on Chinese social media and Chinese search engine. For years, we have been working with our clients on communicating with Chinese customers for our clients on Weibo and WeChat, two most popular Chinese social media. Both of them have more active users than Facebook or Twitter has among Chinese. And since 2015 when more immigrants and tourists came from mainland China, these two social media have been introduced to more and more businesses and organizations outside China. Unfortunately, currently more than 99% Canadian advertisers on Weibo and WeChat are doing advertising same as what they do with those conventional media. Many of you, like our clients, may have been doing advertising on Weibo and WeChat. Unfortunately, currently more than 99% Canadian advertisers on Weibo and WeChat are doing advertising same as what they do with those conventional media. By contacting a media account on these social media platforms and then posting an article or displaying banner ads there, you cannot predict how many views your contents may have and how many of these viewers are from your target market. With UWe TARGET, we optimize not only the accuracy of targeting, but also the advertising cost….In only 3 simple steps you can see a big difference. With UWe TARGET, we optimize not only the accuracy of targeting, but also the advertising cost. After testing for more than three months, the average cost has been sharply reduced. To help more businesses feel the efficiency, we lower the entry level for in-language communication. Our new all-included service plans start from C$299 including almost everything necessary to your advertising, like contents adaption, campaign set up, tracking report, and even the 3rd party advertising cost and tax. Furthermore, we give our guarantees on the results. The basic $299 Impression Plan has a guarantee of 10,000 impressions. And the cost per 10,000 impressions can be as low as C$199. Our Click-Through Plan gives you more option for your advertising. Starting from C$399 and varying by industry, the all-included Click-Through Plan has guarantees on the click through to your website or other landing pages. With UWe TARGET, you can greatly improve the performance of your flyers and newsletters. By defining your target customers, we can deliver your flyers and newsletters to people you want with less waste on delivery and printing. The cost for each flyer or letter could be as little as less than 2 cents. You can have more information about our plans and pricing by visiting https://digitallab.uwex.co/plans/ . Since our services are all-included, to work with us is simple and easy. In only 3 simple steps you can see a big difference. STEP 1: Select the plan and set the goal upon your objectives and budget. STEP 2: Send us your marketing assets and tell us your target market . STEP 3: Leave all others to us and wait for the results. We are open to all businesses and organizations who would like to connect your businesses to Chinese customers in your desired markets, no matter where you are or where they are. Reaching out to Chinese customers is not as complicated as what you had thought. Start your campaign to Chinese now by contact us on https://digitallab.uwex.co/contact/ or email to social@uwex.co.